IonLoop® ion bracelets, wristbands, and watches are a great first-step in counteracting the harmful effects of positive ions. Our high-quality products stand apart from all other ion magnetic products with one of the highest levels of negative ion output in the industry. Our customers tell us that after wearing the IonLoop® bracelets for a few weeks they actually feel different... in a positive, more balanced way. They report faster recovery from workouts. Top athletes use IonLoop® sport bracelets as they may enhance everyone's life in some way. Versatile and Cool! IonLoop® products are so fashionable that they can be worn anywhere, anytime: from sports,to casual attire to business. Our unique designs and fashion colors offer a way for you to coordinate IonLoop® with your activity, event or mood! To build the most effective sport bracelets we have developed Ion Regeneration Technology IRT™; the most advanced technology in negative ion /magnetic products. We pulverize the negative ion producing mineral, tourmaline, and infuse it into IonLoops medical grade silicone band component using a proprietary process. We also use alternating polarity to position our magnets on each bracelet which adds another dimension to the potential stimulus that the magnets may have on the chemistry of the human body. The environment where we live can impact our bodies and our health. Most of us are surrounded by concrete walls and electronic devices for many hours each day. While human kind has created a comfortable lifestyle for itself, these modern conveniences can have negative effects. 1) Electronic devices are shown to throw off concentrated amounts of positive ions but, our bodies need a balance of positive and negative ions. 2) Concrete walls and closed air-conditioned spaces produce higher levels of positive ions than those found in nature, which can be detrimental to our health. 3) In nature, positive ions come from the sun in the form of UV rays which fatigue the body. Negative ions (the good guys) come from organic materials such as rain, trees, plants and minerals. The increased exposure to positive ions can affect our energy levels and health. To counteract the imbalance caused by urban environments, we recommend introducing a natural source of negative ions to your day-to-day life. Studies suggest that magnets may increase activity in the blood flow which in turn would result in a more efficient flow of oxygen and nutrients through the body. So, while even the most powerful magnets do not have the ability to cure a disease, it is thought that magnets may facilitate the healing process. Magnetic products have long been used for improved health by ancient societies and most recently by Eastern medicine practitioners. In the United States and Europe, professional athletes have been known to use magnetic therapy to speed up recovery from injuries, and to relieve pain. 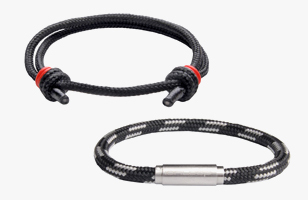 Our popular ion magnetic bracelets are made with two very strong magnets. The disc magnets maybe small but they are powerful and offer the maximum benefits of magnet therapy. IonLoop products allow you to enjoy all the natural benefits of magnets and negative ions: quicker sports recovery, better sleep, stress management, natural energy, better concentration and focus, less stiffness and soreness…more! Our Products In Use Who is Wearing IonLoop®? Professional athletes in a wide variety of different sports have benefitted from using our products. Take a look at who is wearing IonLoop.